Description: Classification of tactical groups is conducted in the article, the list of tasks is certain for the tactical groups of different types, offered approach to forming of composition of tactical groups taking into account experience of their creation and battle application during local wars and armed conflicts. Yarosh, S.P. and Huzchenko, S.V. 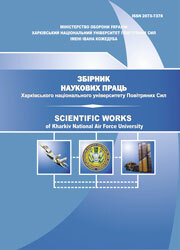 (2016), “Klasyfikatsiia taktychnykh hrup” [Classification of tactical groups], Scientific Works of Kharkiv National Air Force University, Vol. 3(48), pp. 21-25.